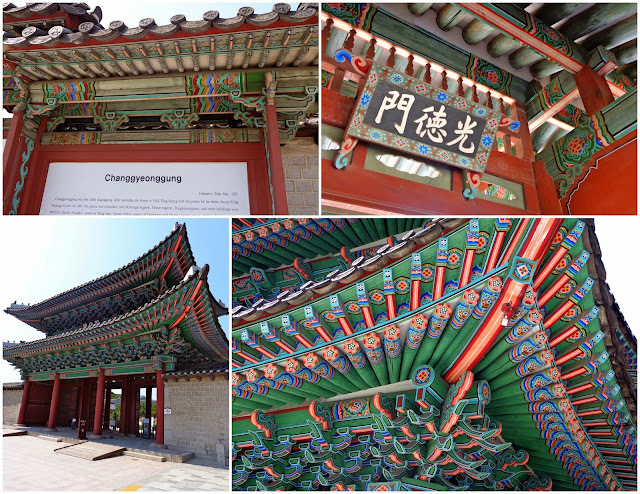 Our first stop on Thursday was the Changgyeonggung Palace, which happened to be just minutes (walking) from our hostel. To make it even better, entrance was free thanks to the holiday that day. Double score! 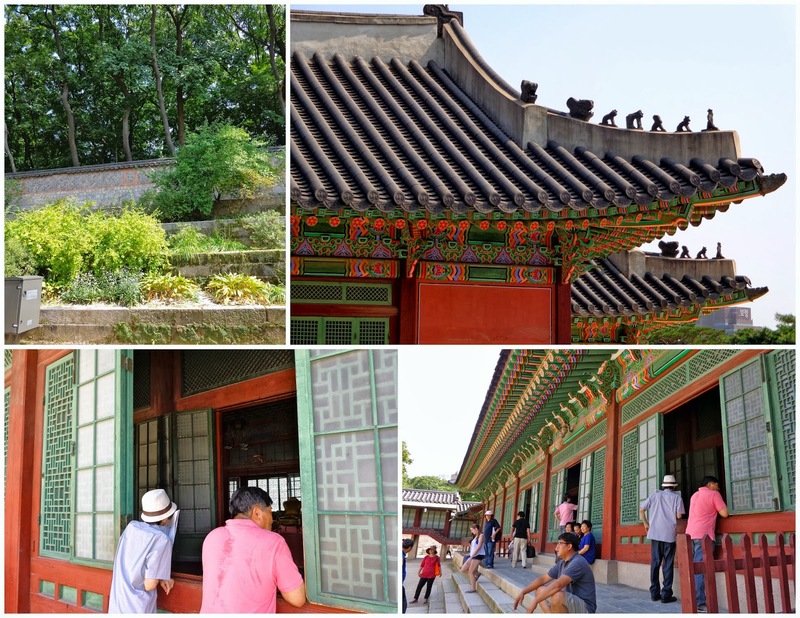 We were mostly walking around the grounds outside, since you couldn't enter any of the palace buildings (you could just peek through the open doors/windows). 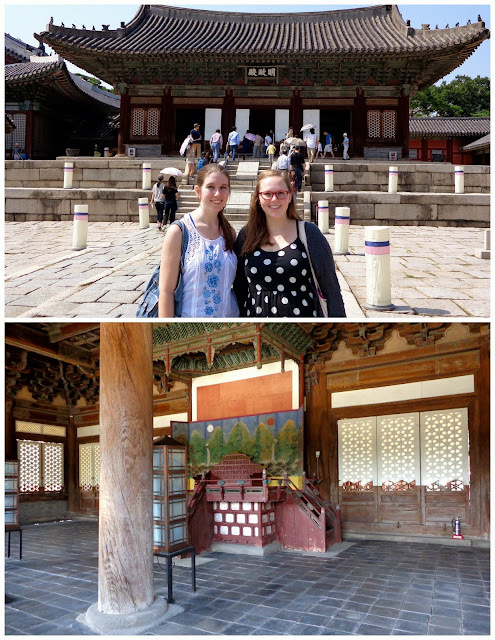 Next we visited the Changdeokgung Palace, which was on the other side of the first palace. Again, no admission fee. Yay! 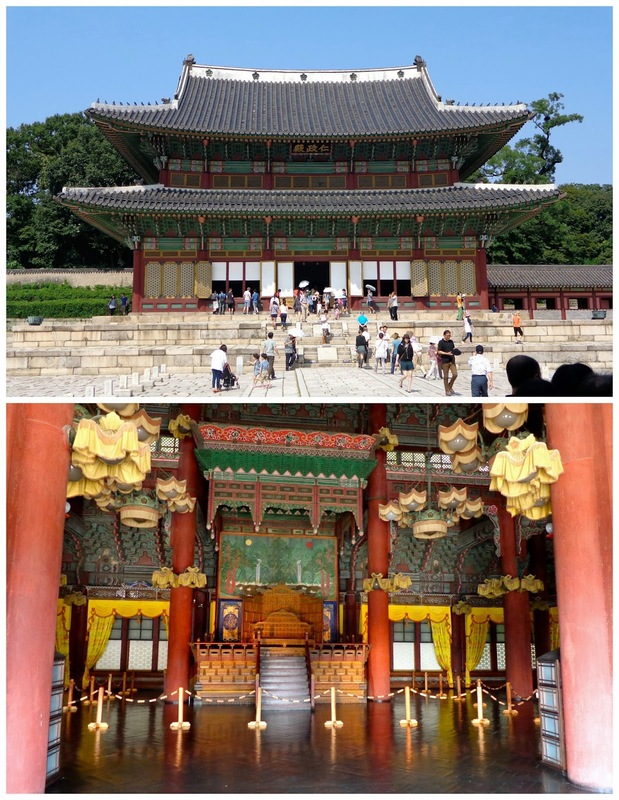 Here's the first main "palace". 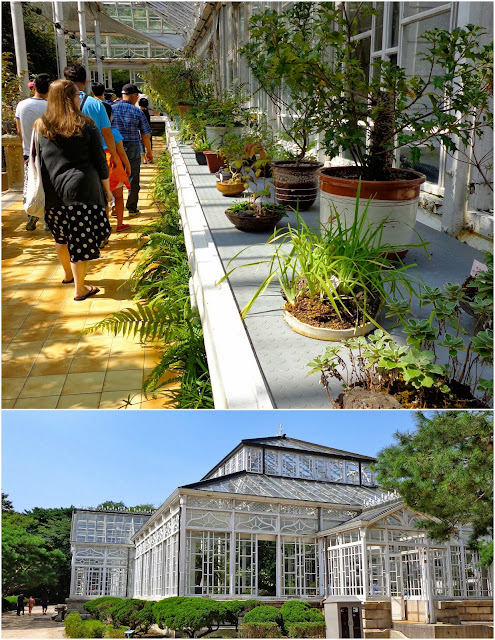 Notice the open doors and "windows" where visitors could take a look inside. The bottom picture is the inside of that building. However, we were not seeing any food at this festival -- just shops and crafts and such. It was hot and we were hungry, so we parted from this main pedestrian street to look for food on some side streets. Guess what? On a big national holiday, restaurants are closed! We ended up in a touristy café, the only open place we found. The AC and sitting was nice though. During lunch we decided that all of us were palaced out for the day, and didn't mind if we skipped out on the third palace we had originally planned to visit. We were exhausted from the sun/heat, all of the walking, and the lack of sleep the night before. After lunch we headed back towards the festival, but much farther down the pedestrian street than we'd been before. And guess what we found? Food stands. Lots of delicious, cheap, authentic Korean food. Whoops. But we were full and now sleepy. And it was past 4 in the afternoon (I think). So we took the metro back to our hostel and took naps. I was woken up at 20:00, but didn't realize I had ever fallen asleep. Guess I slept for a while! We got up and went to a nearby market. I felt pretty terrible -- my ill body needed more sleep and the cough drop I had before my nap upset my stomach (as they always do... but I can't sleep with a scratchy throat!). It was a strange, strange feeling. It felt like so much work just to stand up. I was not hungry, but thought I should probably eat something while we were out. We had some delicious chicken on a skewer from a street vendor for around $1.25. It was great! We came back to the hostel around 22:00 and I was happy to go to bed.